Crystal's 2015 design for a 100,000 ton ship. The new version will be significantly smaller. Crystal’s hugely ambitious expansion has run into a few rogue waves along the way, most notably in its delayed ocean ship program. The line recently shared that it will downsize new-builds and eliminate the concept of onboard apartments. As a result, the new ship projects have been delayed yet again. The sad thing is luxury cruise sellers Cruise Week talked with were not surprised by the news, and, indeed, suggested that Crystal has some credibility issues now when it comes to timetables. Year after year, the schedule for the oceangoing part of Crystal’s expansion has been changed. Back in late 2013, amidst much fanfare, the line announced it would construct seven luxury ships for seven continents. Execs didn't break it down with specifics, but given the fact that company leadership tied the new ships in with visiting seven continents, one assumed they would be oceangoing vessels. 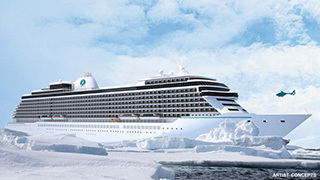 In 2015, after being purchased by Genting Hong Kong, Crystal execs said the first of the 100,000-ton Executive-class ships would be delivered in 2018. Plans were to include 48 "homes with extra-high ceilings." But as the years passed, Crystal delayed, one year at a time, the entry period for the new ships. Now, as 2018 arrives, Crystal says the first of the new ships will arrive in 2022. We can't recall any other project that's had a total four-year delay after the initial announcement; and in addition, the project has dramatically changed in concept despite the still-vague specifics. While disappointing, some luxury agent leaders Cruise Week talked to view this as a rightsizing of what Crystal is now calling Diamond class. "I do believe the more conservative growth for Crystal is smart," said one. "The elimination of the condos, in my mind, keeps people focused on the customers that are most important--cruise passengers." From the beginning, many agents expressed skepticism about the combination of apartment homes on a ship alongside regular paying cruise passengers. Adding to the initial skepticism was that while there has been talk of building a 100,000-ton luxury ship in this business for years, no company ever took the plunge because of the uncertainties of return. Similarly, no company ever tried a horizontal expansion to the degree that Crystal claimed they were attempting -- planes, river boats, yachts, you name it. Not only did Crystal have a lot of elements in play, but they added side elements like the purchase option for the S.S. United States project, since abandoned. As it stands now, Crystal seems committed to building new ocean ships, even if they are smaller. They are doing the new expedition ship (Crystal Endeavor), they're doing their river boats and they still have the air program, though that too has been dialed back since the initial announcement. Crystal’s revised plans make sense. You can call it a correction or a refiguring, but if you read between the lines of what company leadership is saying in various interviews, they realized they were trying to do was more than what the market was demanding. That said, there has been a demand for more new Crystal ocean product for many years, and while Crystal was dithering, competitors in the upper-end ocean cruise market have expanded dramatically. Seabourn, Silversea, Regent, Oceania, Cunard (with a ship order) and others are all moving forward at a fast clip with dynamic new product. At the same time, Crystal reduced the number of beds on Symphony and will reduce the number of beds on Serenity. More importantly, they still have only two ocean ships. Azamara Club Cruises will add a third ship this year. By the time 2022 arrives, it's likely that expanded and newer competitors will be firmly entrenched. Viking now has plans for 10 ocean vessels, which will have almost as many beds as Viking's 62-ship river cruise product. Viking has a built-in base of river customers that they can promote to the ocean cruises and that has helped their growth. Separately and looking ahead, Ritz-Carlton, with its giant system of hotels and resorts, has a customer database probably far greater than anything the luxury ocean cruise lines ever had. At industry seminars Crystal used to promote the image of being the Ritz-Carlton at sea? Now Ritz itself can promote that image. The first of its 298-passenger yachts is to arrive late 2019. Summing it up, Crystal made a much needed correction in expansion, but overall it moved too slowly, and old and new competitors have ramped up the competition in the meantime.